I mean, he really likes pink. I think it’s his favourite colour. Me, I’m okay with that. Pink is just a colour. I don’t like pink much myself – I’m genuinely dismayed at the fact that pink really suits me, because I can’t stand pink. But I figure taste in colour is not hereditary. Unless my husband has a pink fetish he hasn’t mentioned. But I’ve been thinking about this recently, particularly given the recent news articles about ‘Pop‘, whose parents are refusing to disclose her/his gender, apparently in an attempt to a) prove that gender is solely a social construct; b) allow their child to grow up without feeling pigeonholed into specific gender roles, or c) a bit of both. Or possibly other reasons entirely, given that media is about shifting units rather than clear, factual, unbiased reporting. As far as Pop’s parents are concerned, I’m going to do something shocking: I’m going to assume the media has its own agenda (raising revenue through selling more papers/attracting more viewers/gaining more advertising/etc); and I’m also going to assume that however positive their choice turns out to be, that Pop’s parents probably have Pop’s wellbeing in mind. But their choice not to disclose Pop’s gender has had me thinking about how my son’s preferences are being shaped by me and by his father. Generally I think we’re pretty good. To be honest, we do select his clothing mostly according to our own aesthetic; but that’s not gender based. My husband and I have a not-very-secret interest in the goth subculture, and we both wear a lot of black. If we wear something that is not black, it elicits comment. That’s just for context. We don’t dress our son entirely in black, though darker colours do predominate – black, grey – along with bold reds and greens and blues. Oh, and pirate motifs. If our son shows preferences of his own, we go with that. That’s how our son ended up with a pink Upsy Daisy singlet. I was shopping for shoes with the small boy, and he spotted a selection of In The Night Garden clothing. He was about eighteen months old at the time. I showed him the (blue) Iggle Piggle singlet; he grabbed the (very, very pink) Upsy Daisy singlet and refused to put it back. Okay, cool. I bought him the pink singlet. Six months on (that’s a quarter of his lifetime! ), his Upsy Daisy singlet is still his favourite shirt. What bothers me most about the gender typing of children’s clothing is that it starts so young and it’s so all-pervasive. 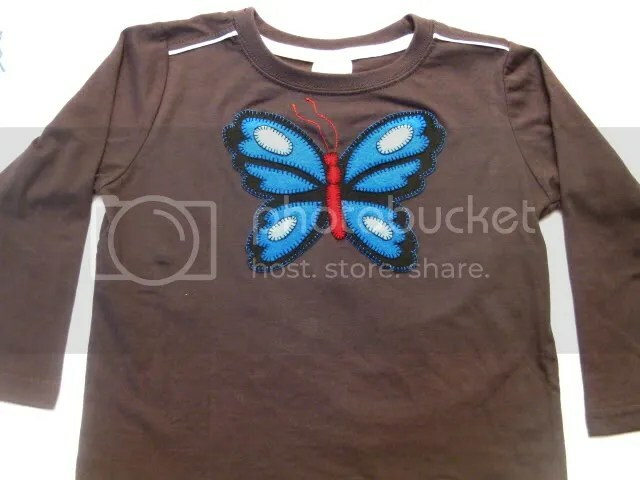 As I mentioned, if our son shows preferences for anything, we go with it – which is why I wanted a toddler sized shirt with some sort of butterfly on it. My boy loves butterflies. Naturally, if I find a shirt with a butterfly on it in a shop, it’s very, very pink. I’m okay with him wearing pink. But I do have a problem with supporting companies which perpetuate the whole girl = pink sparkly butterflies and boy = blue corduroy trucks thing. It bothers me that if I buy a pink butterfly shirt, not only will people assume I’ve put a boy in “girls” clothing, I’m giving money to a company that pushes this horrible stereotype. As far as I’m concerned, butterflies do not belong to girls; and I don’t want to tacitly approve of this sexist crap by paying money for it. I got around this by making him a butterfly shirt that is unashamedly ‘boy’. I think it’s very hard to get around stereotypes – you’re either buying into them, or you’re rejecting them. I kind of felt that rather than hitting either end of the spectrum, mixing up those expectations was a little bit more subversive. The reactions I see from other adults when we’re out and about suggest I might have something there. When he wears ‘boy’ clothing, people assume he’s a boy. When he wears pink, people assume he’s a girl. When he wears a ‘girl’ motif in ‘boy’ colours, people aren’t sure what to think. I really, really wish there was more unisex children’s clothing around – but not in a bland, solid colour design-free sort of way. I’d like to see blue and brown flowers with sequins; pink and purple dinosaurs with big teeth; pink dogs and blue cats (ever noticed that? apparently boys like dogs, and girls like cats! ); beetles and fairies and monsters and cement trucks in all the colours of the rainbow… with lace trimming. Sounds like the perfect way to start your own range 🙂 Both magi and I agree, we don’t push gender, but we don’t confine gender either. (Which is why G got a kitchen for his b’day, and we support that his favourite wiggle is do’thy). Seriously tho, I think you’d do pretty well if you started (and advertised) as gender free. I need to say thanks and make a confession. I’m lucky I get to see all the posts early, and when I read this I was making a jacket for my daughter. I have a new embroidery machine and really wanted to put flowers on the collar, but she kept asking for fish. I ‘convinced’ her to have flowers instead, because she does like flowers, then I read this. So I pulled out all the fish templates and we chose some of those instead. Of course, this is actually the third stitch out because she didn’t want those fish, she wanted pink fish 🙂 So here’s the collar of her new jacket. Nope, not letting me put a picture in. Oh well, it’s pink fish! This same issue is starting to crop up for me. Now I have two boys it seems I won’t get to buy all those pretty girls clothes. But if my son chose all his own clothes, perhaps I would. I was shopping for baby clothes the other day with Owen, he kept choosing the pink and purple body suits for Aiden. Pink is also one of Owen’s favourite colours and given the chance to dress up he will always don a pink sparkly tutu, beads and a flowery circlet for his head. He desperately wanted to get the pink/purple Bonds pretend jeans for Aiden. I wondered for a second and chose the “right” ones – blue with a green dinosaur. What if Aiden doesn’t like dinosaurs though? And why isn’t he allowed to like butterflies and love hearts? I was put on the spot with wondering to explain to a 3.5 year old that those clothes had been designed for a baby girl and that any baby who wears them will be assumed to be a girl. And does that matter anyway? I was aware that my bumbled explanation wasn’t what I really wanted my son to learn about clothing and gender. Later he commented on Aiden’s pink socks “people might think he is a baby girl”. The next day I was shopping without Owen and found a brown fluffy winter jacket that was just the right size for him. On special too. But it had an embroidered motif on it – pink, purple and green teddies and flowers with a flower and butterfly lining too. Again I was wondering about the same issue. I knew Owen would like the jacket just like I did – but it was without a question a jacket for girls. I left the jacket in the shop thinking it was such a shame they hadn’t made the teddies yellow, red and blue and the lining patterned with suns and stars or something less gendered. I hadn’t thought before that I could make clothes which use the colours or motifs my children like in either ‘boy’ ways or neutral ways. What an interesting idea to explore! Thank you for a fascinating post! That’s a gorgeous top, cAt. I think my little girl would love it too! Great post cAt. I have been thinking about this lately too. My son has just been given a wooden kitchen for his birthday and has a baby doll as well as many other traditionally ‘girls’ toys, but I still struggle with the idea of dressing him in pink (mind you he has heaps of purple) I don’t believe that children should ever be stereotyped by gender so why is this a problem for me? I think perhaps it’s because I don’t want to convey the idea that I wanted a girl instead of a boy. As an early childhood teacher I often came across parents who were horrified to see their little boys playing dress ups in tiaras, high heels or dresses and I never understood why it would bother them. It makes me wonder why I would have hang ups about putting Smidge in pink, or butterflies or pony motifs- after all it is just another form of self expression. Perhaps it will only be a problem while I am picking his clothes, I would find it a lot easier to shrug off if it was something that he particularly liked. I agree with Bill, I would be buying your clothing line too! I am so encouraged whenever I read posts like this. I am currently in the process of writing a book about the impact of gender stereotypes on little boys, and it is experiences like yours that tell me I am on the right track. I have focused my efforts on media and toys, but clothing is another gender minefield. I get so tired of the superhero/construction vehicle/ugly bug designs that pervade boys’ clothing, but it never occurred to me to take matters into my own hands like you have done. What a great idea! In response to the post about dress-up, my almost-3-year-old son is currently into purses and started carrying one around yesterday, complete with Kleenex and snacks – just like Mom. He was thrilled to be able to pull a snack from his purse for his older brother, just like I do. Role playing is so important to kids’s development and it is such a shame that some parents will deny their sons the opportunity to try on a variety of roles, simply because of their belief that certain games of pretend are “gender-inappropriate”. Hopefully blogs like this will start to get the message across that all experiences that provide learning are good for kids, even if it means we start seeing boys wearing pink and carrying purses. Frankly, purses are fun. All kids like them, boy or girl, because they’re often easy to open and close, they have lots of little pockets and sections you can look through and hide things in – and as you mention, it’s perfectly normal for kids to mimic the adults around them. My son also has a purse – it’s one of my old purses, so it is black with skull motifs (*haha*) and not pink. But he loves having a purse to put his money in and use to put cards in and pull them out again. I mean, who wouldn’t? Prams are another one – I’ve come across so many people who find it odd that little boys might like to push around toy prams or strollers. They have wheels! Of course boys like them too. So much of this gender stuff, in my experience, seems to come down to some (often unspoken) fear that if boys do effeminate things, they’ll grow up to be homosexual. Leaving aside questions of acceptance or tolerance, do people really think that you can catch ‘gay’ from pink items? It defies belief – and I think it only serves to create hangups in boys when they’re a bit older, particularly as they get to puberty and start finding more questions about themselves than answers. Adolescence is hard enough: I really don’t need to make it any harder by trying to squish him into a gender-shaped box at the age of two. I wonder if Samuel sways away from gender stereotypes because he has an older sister or if it is more because I don’t really buy into them myself. Now I say this as the mother of a daughter who for her first couple of years lived in pink – but that was not because I chose my little girl pink clothes or because she favoured fairies and butterflies but more because I really only purpchased one or two items of clothing for her in her first couple of years and all the gifts that she received were pink! Maybe that was because that is predominantly all that is available for little girls! As for Samuel – apparently according to my sister and BIL “if he’s gay you’ll be to blame” *shakes head and sighs*. He wears pink – so the freaking heck what? Can you tell I’m sick of hearing about it? His PJ’s are pretty much all pink – the rompers with the feet in that Isabelle wore when she was about 2 have fit him for months and I will be blowed if I’m going to spend more hard earned dollars on new suits just so I can get him blue, green or red. Not to mention contributing to unnecessary clothing production resulting in more environmental damage when we have perfectly good PINK clothes here! All of Samuel’s MCNs are pretty much pink, he wears grey trackpants that have little silvery butterflies on the bottom cuff, and loves his handbags and Mummy’s shoes! I am not a fan of the sugar and spice and all things nice girly stereotype just like I’m not a fan of the “boys are trouble” male clothing trend. A couple of weeks ago DD and her cousin (both just over 3) were getting their faces painted. DD piped up that she wanted a pink butterfly. Her cousin immediately said he wanted the same, a pink butterfly. When it came to his turn, the lady asked if he wanted a butterfly or a bat and he said “A butterfly! A pink one! There’s the pink paint, right there!” 🙂 The lady checked with me and I said it was fine, let him have what he wanted. So off they both went, playing as butterflies flapping their wings for the next couple of hours. My sister and her husband had no problem with it at all, even taking the two of them out to dinner still painted 🙂 Apparently my nephews favourite colour is also pink. Thanks cAt – I feel inspired to seek out or decorate some clothes for my boys that don’t label them as cheeky monkeys, here comes trouble, little monsters, etc or into spiderman or whatever is the latest movie craze. The offerings for size 3 and up are dreadful in most stores. School shopping this weekend I noticed that the fabric chioces are VERY different for boys and girls. There were 3 different weights of hooded sweatshirts for girls and only heavyweights for boys. is temperature not an issue for my male offspring?